One of the major goals of DNA nanotechnology is to create a self-assembling 3-dimensional crystal array that can be used to organize molecular components in specific molecular shapes. The intention is that such a 3D crystal array can be employed as a scaffold for the delivery of chemicals on the nanometer scale or for the organization of nano-electronics. Researchers have endeavored to build crystal arrays of ever-increasing size. The notion is that 3-dimensional crystal arrays with large cavities can be put to more potential uses than arrays with smaller cavities. This proposed project will seek to design four DNA rhombohedral models of different sizes using a 3D printer, and then crystallize these four rhombohedral structures. This project will attempt to build four crystal arrays of different sizes by varying the number of nucleotide pairs between each turn of the DNA double helices and by changing the edge length of those double helices. The goal of the experiment is to determine whether rhombohedral structures can be developed with structural integrity and with cavities larger than those developed to date. Since the 1980s, when the conceptual foundations for DNA nanotechnology were first derived, researchers have had considerable success in constructing a variety of 2-dimensional (2D) DNA structures on a molecular level (Seeman, 2005). Researchers have built these structures by using a process involving “sticky ends,” which occur when two strands of a DNA double helix are of differing lengths (Seeman, 2016). In such instances, the end of the longer DNA strand will have unpaired nucleotides, which can then be joined with the unpaired nucleotides at the end of a strand of a separate DNA molecule (Seeman, 2016). In this way, the two sets of unpaired nucleotides are “sticky” in that they can be used to connect DNA strands with one another (Seeman, 2016). Using this process of connecting sticky ends of separate DNA helices, researchers have created a remarkable number of self-replicating 2D patterns (Seeman, 2016). In recent years, several nanotechnology researchers have endeavored to make 3-dimensional (3D) DNA structures, particularly ones that are large enough to order molecular components in a precise and predictable fashion (Seeman, 2005). As described in a series of papers published between 2009 and 2016, a team of researchers led by Nadrian Seeman has succeeded in creating a 3D DNA structure in the shape of a rhombohedron (Zheng et. al., 2009; Seeman, 2010; Seeman, 2016). The process was performed in two principal steps. First, the researchers created a series of DNA double helices in the shape of a tensegrity triangle (Seeman, 2016; Zheng et. al., 2009). 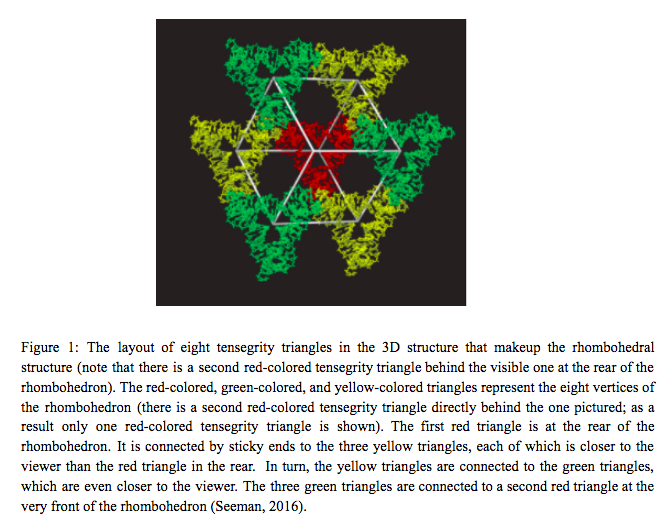 Next, as shown in Figure 1, the eight tensegrity triangles were joined to one another through “sticky ends” in the shape of a rhombohedron, with each tensegrity triangle serving as one of the eight vertices of the rhombohedral structure (Seeman, 2016; Zheng et al., 2009). Researchers formed the tensegrity triangles in 3D crystal arrays by using three double helices, with each double helix forming one side of the triangle (Seeman, 2016). In the rhombohedral crystal array first developed by Seeman, the researchers utilized DNA tensegrity triangles with 21 base pairs for each edge of the triangle, with a 2/3 turn for each double helix, meaning that the DNA strands did a full twist around every seven pairs of nucleotides (Zheng et. al, 2009). A full turn for a double helix occurs when the DNA strands do a full twist around every 10.5 pairs of nucleotides (Seeman, 2016). The strands of the DNA helices had sticky ends containing two unpaired nucleotides (Seeman, 2016). Using the sticky ends at the end of each side of the tensegrity triangle, the researchers were able to connect the tensegrity triangles to other tensegrity triangles in different planes and to thereby form 3D crystal arrays with a rhombohedral structure, as depicted in Figure 1 (Seeman, 2016). These arrays were approximately 250 µm in size, with the largest having a volume of approximately 103 nm3 (Zheng et. al., 2009). To date, researchers have had limited success in constructing 3D DNA structures larger than 100 nm3 (Seeman, 2010; Zheng et. al, 2009). The largest reported 3-dimensional crystal array constructed through DNA nanotechnology was rhombohedral in shape and had a cavity of 103 nm3 (Seeman, 2010). When researchers have attempted to construct larger rhombohedral structures by increasing the side length of the DNA double helices in the tensegrity triangles, their 3D crystal arrays have become less rigid and sturdy (Seeman, 2010). In analyzing these 3D crystal arrays using X-ray diffraction data, researchers have encountered lower resolution than previously-constructed rhombohedral structures, suggesting that the DNA helices were not in a well-defined location and that the 3D structures lacked structural integrity (Seeman, 2010). Researchers do not fully understand why larger side lengths have led to a less sturdy 3D structure (Seeman, 2010). The purpose of this investigation is to determine whether varying the side lengths of the tensegrity triangles, combined with changing the number of paired nucleotides between each turn of the DNA double helices, can create larger rhombohedral structures with cavities (or crevices within structures) of significantly greater volume and with greater structural integrity than have been manufactured to date. This project will design and test the structural integrity of four rhombohedral structures, each of which will be composed of tensegrity triangles with DNA double helices with different side lengths and different numbers of nucleotide pairs between turns, as reflected in Figure 2. In addition, this project will design and test four DNA rhombohedral structures with the following specified edge lengths and number of nucleotide pairs between as reflected in Figure 2. Prior efforts to construct rhombohedral structures have succeeded in producing well-defined crystal arrays where the edge lengths were 21 nucleotides long with 7 pairs of nucleotide pairs per turn. This project will attempt to build sturdy rhombohedral structures with edge lengths of a greater number of nucleotides. All of the edge lengths that will be designed during this experiment will be greater than 21 nucleotides long. This project will also vary the number of pairs of nucleotides per turn. Two arrays will have DNA helix with turns every 7 pairs of nucleotides; one crystal array will have turns every 17 pairs of nucleotides; and one array will have turns every 28 pairs of nucleotides. These different edge lengths and different numbers of nucleotide pairs per turn will create different rhombohedrons, with different coordinates. This will allow for the evaluation of the effect of different turns and edge lengths on the rigidity of a crystal structure in the shape of a rhombohedron. This project will contribute to the field by showing how certain configurations of side lengths and nucleotide pairs per turn affect the structural integrity of rhombohedral structures. In the event the proposed combinations result in the formation of 3D arrays with structural integrity, the project will have brought specific rhombohedral structures to the field’s attention. The first step of this project will be to design each of these four rhombohedral structures on a computer program, NanoEngineer, so that the coordinates of the rhombohedral structure can be recorded. Once the coordinates are known, models of the rhombohedral structures will be 3D-printed, using the 3D printer in the Seeman Structural DNA Nanotechnology Laboratory. The project will next use synthetic DNA to build the contemplated 3D rhombohedral structures, which will contain the edge lengths and nucleotide pairs per turn set forth in Figure 2. The same procedures used by the Seeman Structural DNA Nanotechnology Laboratory in prior constructions of 3D crystal structures will be followed here. DNA sequences for the tensegrity triangles will be designed using the online program SEQUIN, and will be ordered from Integrated DNA Technologies, a company that creates custom synthetic DNA strands. DNA stands will be purified by denaturing gel electrophoresis. Next, butanol will be extracted from each DNA strand, in order to remove impurities from the DNA solution. Finally, DNA strands that make up one rhombohedron will be combined together and placed in a tray in a incubator, to allow the crystals to grow thermally. This step will be completed for all four rhombohedral structures. Crystals will be obtained by slow annealing; incubator temperature will be decreased from 65 °C to 20 °C with a cooling rate of 0.4 °C per hour. Finally, x-ray diffraction will be used to measure the resolution and strength of the rhombohedral structures. X-ray diffraction is a technique used to determine the molecular structure of a crystal. This technique involves using x-ray beams to determine the position of atoms in a crystal by measuring the angle and intensity of x-ray beams as they are diffracted from the crystal array. If a structure is well-ordered and has structural integrity, the diffracted x-rays will present a clear picture of the array’s molecular structure and and it will be possible to determine the position of each of the DNA strands making up the rhombohedron. A refractometer will be used to measure x-ray diffraction and the degree of resolution of each DNA strand in the crystal array. The diffraction data will be processed in PHENIX, a computer program that will help model the DNA crystal and show the degree of resolution of each of its tensegrity triangles.